Your employees know they should visit the dentist regularly. But much like flossing every day, many find it easy to put on the back burner and end up going years without a simple cleaning or checkup. When minor issues are left untreated, they can snowball into serious conditions that can affect everything from the employee’s overall health to workplace productivity and health insurance costs. 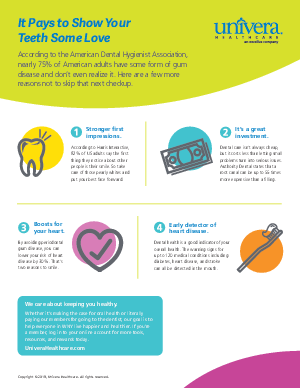 This one-page handout makes the case for oral health and provides a little extra motivation for scheduling that next appointment. We care about our community and want to do all we can to help Western New York continue to thrive. Whether it’s sharing quick tips like these or offering a creative take on dental rewards programs, we’re here for you with the tools, resources, and guidance to keep your employees and business healthy and strong.